I was recently interviewed on camera as part of Women's Sport and Fitness Foundation's (WSFF) campaign to get more women in London and across the UK to participate in sports and be more active in general. In Fall 2008, I applied for and was accepted to the Sweat In The City program, a WSFF initiative which offered a free three-month gym membership to nearly 3,000 women (under 25) across London. The only catch was that you'd be required to blog about each gym visit and you had to commit to going 3 times a week - not a problem for me since I had no social life to speak of at that time (not saying that I have one now). I admit it sounds lame, but I was hoping that through this program I'd be able to meet some friends and also shape up, as I wanted to run a 5K in the spring. But I got more than I bargained for - in a positive way. Let me start by saying that I've always liked the British attitude towards fitness, which is much more relaxed, in my opinion, than in America. Brits are more likely to go away for week-long hikes in the Lake District than spend their after-work hours sweating away in some basement gym in the city. They (for the most part) also have a healthy attitude towards food and practice good portion control as well as advocate growing their own vegetables, etc. whenever possible. I think (most) women are of a healthy size here - neither obese nor anorexic, but rather quite literally, heatlhy. But when I started the program, I quickly realized why it's so important to get more women active and this was further evidenced by a question asked during the interview. I think the question was something like, "Why don't you think women exercise more in the UK or are motivated to keep up a regular gym routine? And do you think sport takes away their femininity?" I flashed back to about a year ago when I was staring at my arms in the mirror and commented to John, "I want really cut arms." John looked up from his magazine and frowned, "But not really cut, right? You don't want to look like a bodybuilder!" I whipped around and said, "Well, yes, actually, I do want really defined arms - I don't find anything wrong with that." I knew what he meant: Madonna arms. And while I definitely do NOT want Madonna's Frankenstein arms, I was hoping to achieve something past flabby bingo-wings. Zoning back to the interviewer's question, I found myself saying, "Yes, yes I think women in the UK are afraid that atheleticism or a strong body will take away their femininity." 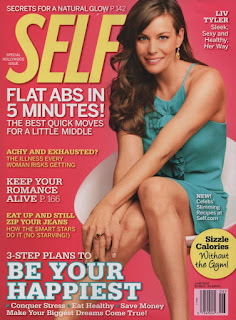 See, in the US, we have magazines like Self (above) and Shape (right) that are devoted to women's fitness. There are blogs (such as Fitsugar.com) that give advice on everything from improving yoga postures to interval training ideas. Fitness in the US can be an obsession. We idolize female atheletes and women with six-packs and muscular arms and legs. But never, in this country, have I ever seen a magazine in the newsstands dedicated to women's fitness. They don't exist. And it's probably because most British girls and women idolize anorexic "celebrities" like Victoria Beckham and Cheryl Cole Tweedy. Celebs who, instead of eating healthily and working out, are afraid of bulking up and prefer to nibble on edamame beans and sip green tea to survive. So naturally, WSFF had to come up with a cringe-worthy but clever way of drawing the glossy magazine-clutching young women of London into the realm of sports and fitness, and they came up with the name, Sweat In The City. I have to say though, that personally, participating in the program was a life-changing experience for me. I was able to join a great gym in Covent Garden which didn't have the super-competitive element (and overall obnoxiousness) that gyms like Virgin Active and Fitness First have and I found a terrific yoga class that I love. And since it's so close to my office, I can change at work and just go, so I've got no excuse. Six-pack and toned arms, here I come.